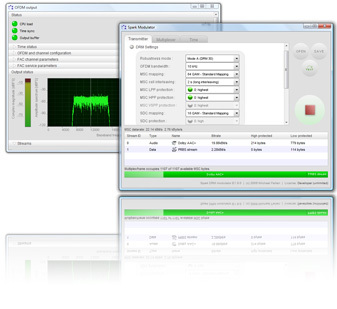 Spark is a realtime modulator software for Digital Radio Mondiale (DRM) and analog FM/AM radio standards. The software supports all code rates, bandwidths and robustness modes (A, B, C, D, E) published in the DRM standard as well as all mapping schemes, such as Standard Mapping with 4, 16 and 64 QAM, Symmetrical Hierarcical Mapping and Mixed Hierarchical Mapping. Additionally, Spark can generate MDI, AM+AMSS, FM+RDS signals and supports up to four xHE-AAC live audio streams. DRM receiver testing and validation. DRM exciter testing and validation. OFDM signal generation from MDI. IP for custom DRM solutions. Spark allows for broadcasting or receiver testing using DRM, DRM+, AM+AMSS or FM+RDS. It can be configured to work as a DRM content provider for MDI content streaming as well as standalone MDI to OFDM modulation. Spark was designed to run on Windows and Linux, allowing maximum flexibility for your test platform. The build in automation features in Spark allows for remote-controlled (via Python) or time-scheduled settings and broadcasts for all radio standards and modes. This makes it possible to automatically test your multistandard receiver with different radio signals using one single test signal source. Spark is the low-cost entry-level solution for broadcasters and DRM system developers. The software includes the most important broadcasting applications without the need of expensive professional digital radio broadcasting equipment. This makes the software ideal for regional broadcasting, DRM field trials, system evaluation and testing. 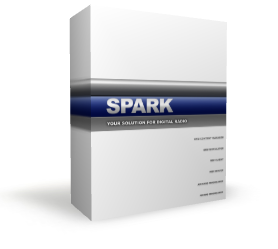 Spark provides numerous input and output options and can be used standalone or integrated and customized for your specific needs. Furthermore, the software can be used with external RF devices such as the DiRaGen USB, National Instruments DAQ USB devices and Ettus USRP device. In terms of hardware, Spark is plug and play. All configuration options can be changed, loaded and saved without interruption of the active broadcast. The user interface (UI) of the Spark transmitter software was designed for maximum user-friendlyness and to be intuitive to use. UI elements are designed with respect to the requirement of the digital radio architecture in order to guide the user through the configuration of the application. All receivers based on the Radioscape RS500 module, i.e. the Morphy Richards DRM receiver, the Himalaya 2009, a.s.o. Please have a look at the Spark licensing options . If you like to receive a quotation, please get in touch with us via e-mail to or use the trial version form below. For tailored features, please feel encouraged to add your ideas and requirements to your message. The trial version is provided for software evaluation purposes (not for commercial use). 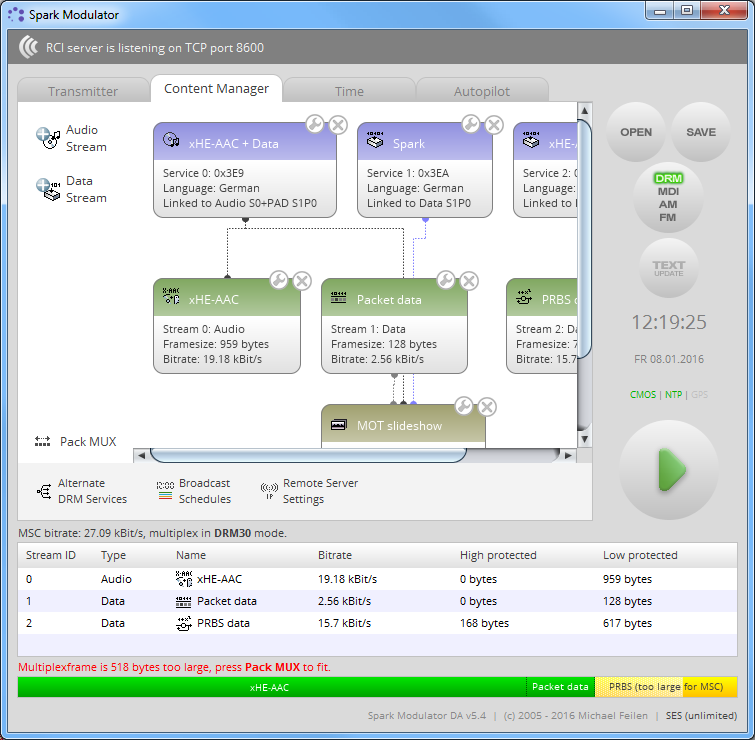 DRM Content Manager: DRM stream and service configuration panel showing an xHE-AAC service, a MOT slideshow service and a PRBS service. The streams and their respective bitrates are listed in the table and the bar at the bottom of the window shows the MSC bandwidth occupation. Transmitter Panel: Mapping, coding and OFDM configuration. In the example, DRM Robustness Mode A is configured together with soft-clipping OFDM predistortion. 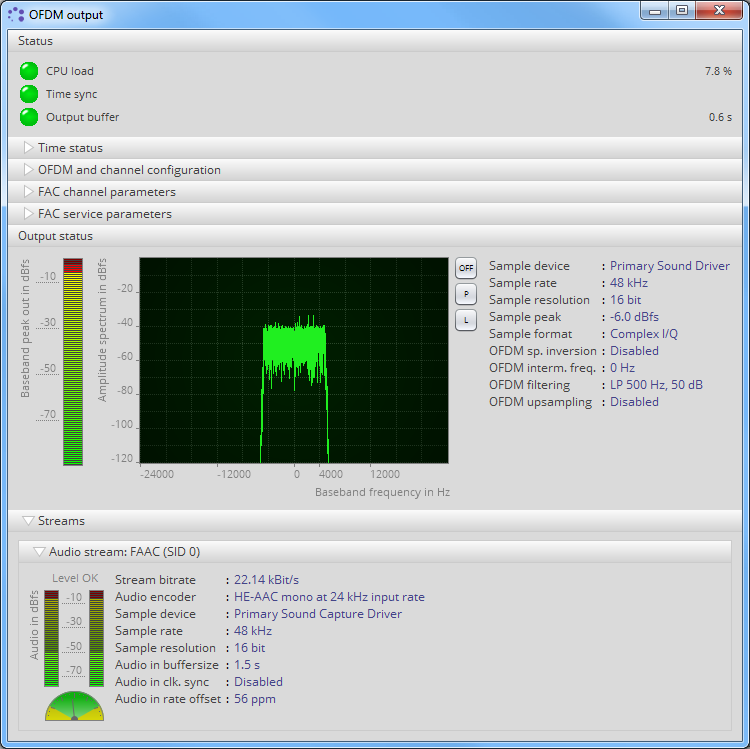 OFDM Output Panel: The baseband transmission window shows that the PC soundcard is used as audio input and OFDM output device.